Yesterday’s Amber Alert for 16-year old Cassidy Geffert has had another ugly outcome. In addition to creating controversy and disturbing a lot of people, it also resulted in some people turning off the alerts on their phone altogether. 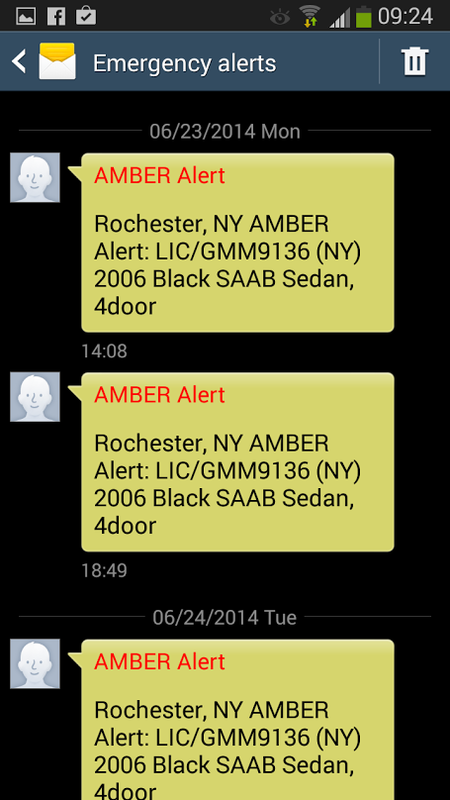 Around 1:30 yesterday an alert went out telling people to look out for a black 2006 SAB sedan. It seems that for many mobile phone customers the alert was repeated over and over again. One AT&T customer tweeted that he got alerts at noon, 1:25pm, 4:55pm, 6:07pm, 9:45pm, 11:08pm on the 23rd, then at 2:33am, 4:28am, 7:35am, and 11:10am on the 24th. Another person tweeted that he got 48 alerts and that they kept him “up all night”, while a third tweeter said she’d gotten 20. We called the NY State Police and were told that they’d had similar reports by email. The specific type of alert discussed in these tweets is not certain. Public safety officials have several alerting systems available to them, including NY Alerts, Hyper-Reach, and others. But a few tweets included pictures of the alerts as they appeared on the user’s phones. In addition, Hyper-Reach personnel received some of these duplicates, so we know that at least some of the alerts were from the Wireless Emergency Alert (WEA) system, also known as IPAWS, which is administered by FEMA. The WEA function is provided by default by most wireless carriers and is installed on most phones manufactured in the past few years. But – with the exception of alerts sent by the President of the US – WEA alerts can be turned off by the customer. Unfortunately, customers who chose to do this will not only avoid Amber Alerts, they will also miss National Weather Service alerts about severe weather and other public safety warnings that could save their lives. An irony of the situation is that yesterday’s Amber Alert was false to begin with. Geffert was found an hour later at a Brockport, NY hotel and arrested for grand larceny. Police have confirmed that she was not abducted, although they have not commented further on the case. Thanks for the Amber Alert yesterday at noon, 125pm, 455pm, 607pm, 945pm, 1108pm & today at 233am, 428am, 735am, then 5 mins ago. PLS STOP. Does anyone else keep getting the Rochester Amber alert on there phone? this amber alert keeps going off in mine and Tyler’s phones! Is my phone the only one still getting an Amber Alert? Anyone else get another amber alert? Hey @ATT please stop sending me yesterday’s Amber Alert. We’re in @CHSBuffalo Labor/Delivery, you keep waking our newborn. You’ve sent 10x! Just got the amber alert on my phone again,? I’ve gotten the same amber alert to my phone 4 times. The chick was found yesterday. *** ****. Soooo why ** did another amber alert get sent to my phone . . . I now have 20 .
why am I still getting the amber alert? ****ing #annoying, kept getting that #expired#amberalert from #yesterday once an hour upon getting to #work. Turned them off completely. Why the **** am I still getting this damn amber alert to my phone ?